Krasnokazarmennaya Street begins from Lefortovskiy Bridge across Yauza river. A large ancient park is aligned along the river embankment; the park is well known for its historical monuments and beautiful lakes. The main entrance to the park is shown on this photo. The street with tracks in the centre climbs from the embankment up the slope of the river valley. 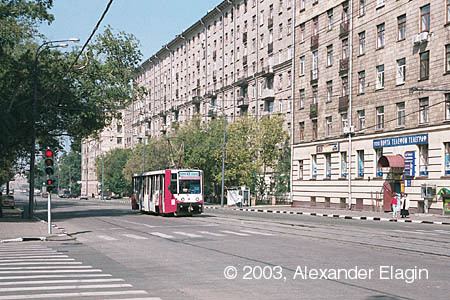 A large number of buildings that are arranged along Krasnokazarmennaya Street and lesser side lanes of this district host various institutions of a defence ministy. Many of those buildings are rather old and are now being renewed. 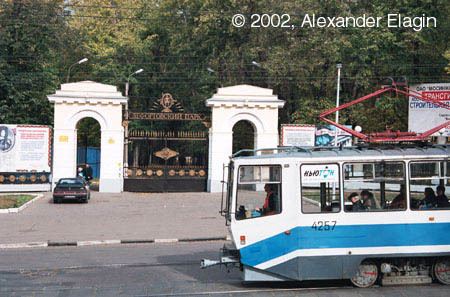 Krasnokazarmennaya Street crosses Prolomnaya Zastava square. 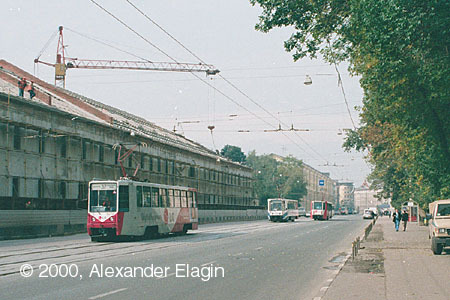 A long time ago another tram line branched here to 1st Krasnokursantskiy Proyezd, but that line was closed for indistinct reasons. Almost all former track bed of that line is clear today in a form of a green lawn without tracks but with traces of overhead wire supports and all the masts still in place. 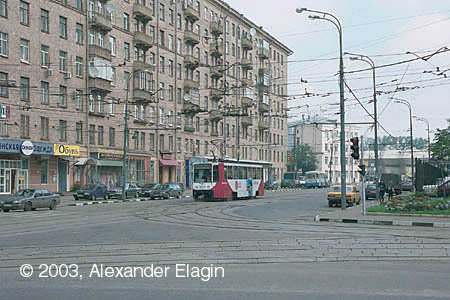 A crossing of Krasnokazarmennaya Street with Lefortovskiy Val Street. This stretch of the street has a few residential buildings erected in early 1950s. 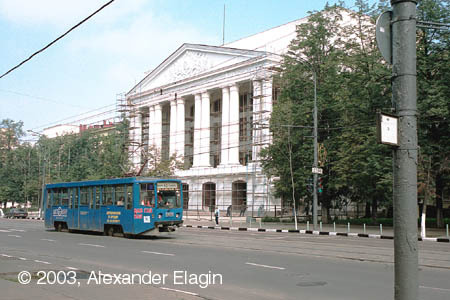 The main campus of the Moscow Power Economy Institute faces Krasnokazarmennaya Street. 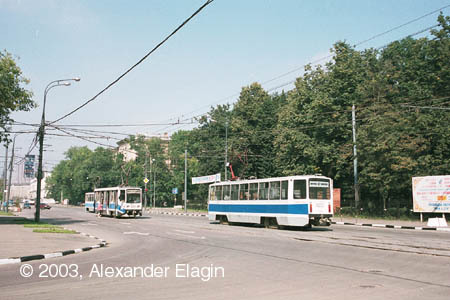 The last section of Krasnokazarmennaya Street before its junction with Aviamotornaya Street. The tracks of this section had been the only connection with the trunk line in Shosse Entuziastov until 1969. 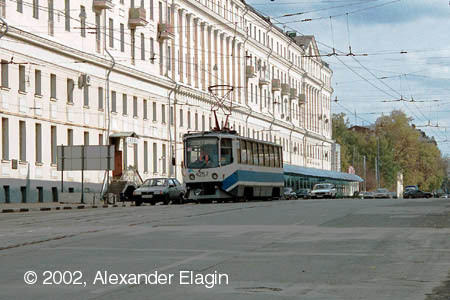 A new passage with a new tramline eventually replaced the old configuration (a branch to the currently used link can be seen in the right part of the photo), but the tracks of the old line are still in place today.